Payment can be made by cheque (payable to SQT Training Ltd), by credit card or electronic bank transfer. Full payment to be made at least two weeks before the course commences. lease book accommodation directly with the hotels. 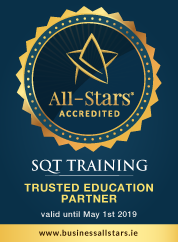 Also please indicate that you are attending a SQT training course in order to avail of the Special Rates.Full course fees remain payable for delegates who fail to attend.SQT Training Ltd. reserve the right to cancel a course if there is insufficient demand.